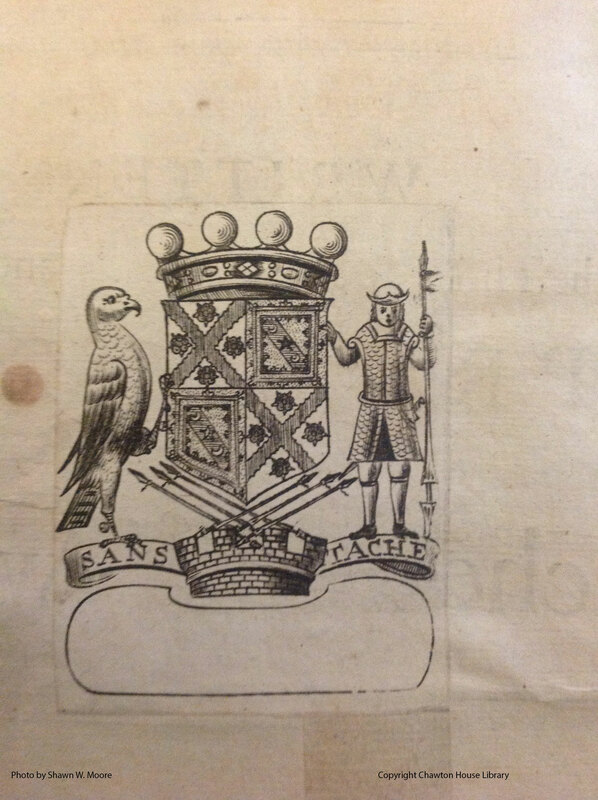 Here is an image of an armorial bookplate found in the Chawton House Library copy of Cavendish’s Plays, Never before Printed (1668). Thanks to the Scottish Catalogue of family crests and coat of arms, we can tell that the bookplate features the coat of arms for the Lord Napier. The coat of arms indicated on the bookplate match the coat for the united title of Lord Napier and Baronet of Thirlestane. This occurred with the 6th Lord Napier in 1725. 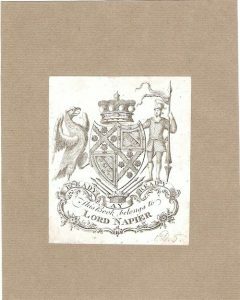 The second image below is of a bookplate from the 9th Lord Napier and includes the addition of the motto: Aye Ready Aye not shown on the earlier bookplate. This motto, a traditional Scottish naval reference appears along with the Sans Tache motto on all coats of arms for the Lord Napier after the 9th Lord. The question then is which Lord Napier the bookplate in Plays, Never before Printed (1668) indicates. It could be that of the 6th Lord Napier, the 7th Lord Napier, or the 8th Lord Napier. If you have any ideas or suggestions, please let us know!